One of the best hostels I’ve ever stayed in. There is a rooftop, hot tub, good kitchen, cinema, small gym and a lounge area to use. The bathrooms are always super clean and bedrooms are comfortable (Mannie the cleaner was always happy to chat). It is in a very central location meaning you can walk everywhere. Will definitely return again when I stay in Melbourne. Staying at the Space hotel was quite an unexpected pleasure - it provided me with accommodation that was first class. The staff were very welcoming and always friendly when approached. Cleanliness was tip-top with the shared washrooms. All in all excellent value for money, making y stay in Melbourne the perfect venue. Thank you. 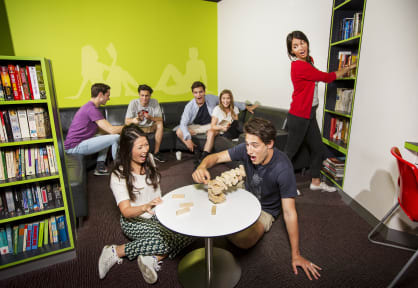 A modern hostel. Very clean and ‘upmarket!’ I stayed in a 4 bed female dorm - loads of room and good sized locker, shelf by bed - light, plugs etc! Very well equipped! Laundry and kitchen good to! Staff very friendly and hostel was in a good location - easy to walk around everywhere in Melbourne! Stayed here with my girlfriend for 2 nights in a Private Room. The room was nice and clean and comfortable with fresh towels and a TV. Jacuzzi on the rooftop was a really good touch and the rooftop was a great spot for catching some sun! The location is great as it’s near the free tram and walking distance from most things in the city. They also had different activities on eg. Picnic in the park with free food & alcohol which was a good way to meet fellow travellers. Would stay again! Place was very clean, spacious room and clean showers. Great overall experience, but not great for socializing. The facilities at this hostel are good: spacious rooms, great, movie room, rooftop terrace etc. The only thing lacking is atmosphere. So basically the layout of a hostel, but the anonymity and extra facilities of a hotel. Being a lone traveler this is definitely not the place to meet people, but it is a great night’s sleep. Lockers and reading lights very luxurious, bathrooms kind of look like you’re in a jail cell and a lot of them flood. Great location though. The place was very clean and secure, location was decent. Atmosphere was not super great. I was a solo traveler and it was hard to meet other travelers. The hot tub on the rooftop was one of the appealing things but it was closed when I was there. The bar attached to the Hostel was a much older crowd too - not your typical hostel crowd. It was a little weird to me walking the halls and there would be children running around or people in their late 40s and 50s hanging out in the common areas. the hostel is clean, facilities are nice but a few frustrating issues. First of all, is all of Australia backwards with their internet ? You pay over $30.00 usd for a bed and you have to pay extra if you want internet ? Really? Not very customer service like. Then this hodtel has great kitchen but if you want to use a fork or spoon, there is a $10.00 deposit on utensils. I guess management has never stsyed at many hostels to know some basic standards.